2017 was a big year in Canada – it celebrated its 150th birthday with events all over the country, peaking on Canada Day on 1 July, and free entry to all National Parks. But there’s never a bad time to visit Canada. To give you a taste of what the country has to offer, I’m sharing the most memorable moments from my leg of the #ExploreCanada road trip from one side of the country to the other in a Cruise Canada RV. Whether they’re big adventures or little things, they all added up to make an unforgettable trip from Calgary to Toronto. 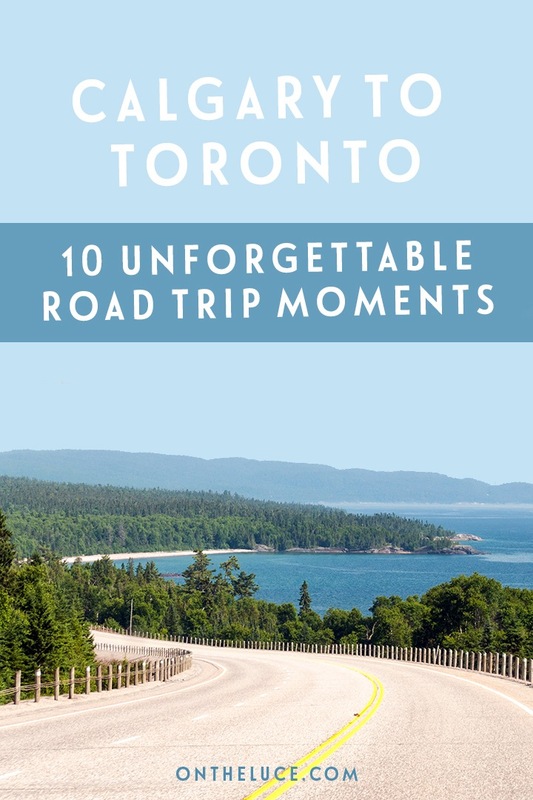 And who knows, maybe they’ll inspire you to head out on the road in Canada too? 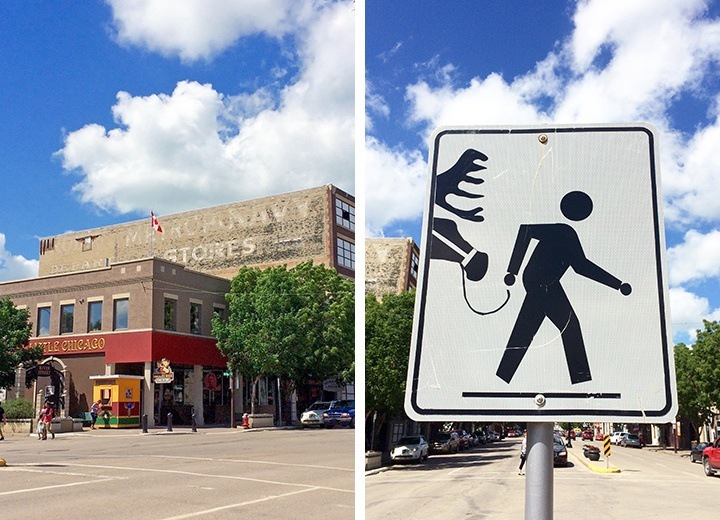 A 1920s haunt of Al Capone with a history of gambling, prostitution and bootlegged booze – Moose Jaw wasn’t what we expected to find in the middle of the prairies. 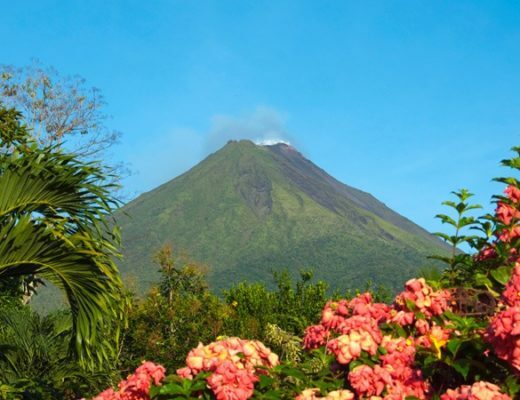 Today the town is full of cafés, colourful murals and some very relaxing thermal springs. But during Prohibition it was christened ‘Little Chicago’. It was a hub for smugglers who used tunnels under the town to produce and supply alcohol across the border. You can go back in time to the bad old days at the Tunnels of Moose Jaw where they run a couple of different interactive tours. We took on the part of wannabe bootleggers on their ‘Chicago Connection’ tour led by gangster’s moll Miss Fanny. We visited a speakeasy, climbed through a fireplace and were chased by through the tunnels by the police, before re-emerging back into the 21st-century. Regina is Saskatchewan’s provincial capital, home of the Mounties – and knows how to throw a good party. Our stopover in nearby Regina Beach coincided with Canada Day, so we headed into the city to join the celebrations. 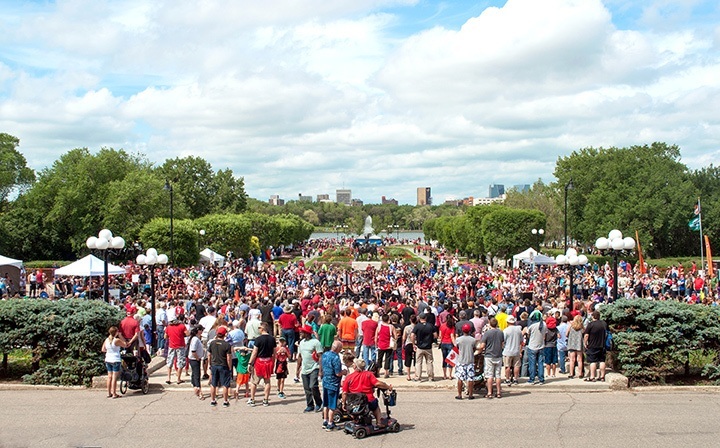 Thousands gathered around the lake in Wascana Park and there was a great atmosphere. Events were a real mix, from First Nations dancers to local bands and weightlifting strongmen. And some more bizarre, like the Plywood Cup where groups built boats from plywood and competed in a race across the lake – or at least tried not to sink along the way. And of course there was food – homemade lemonade, butter tarts and our first poutine (chips, cheese curds and gravy if you’ve not had the pleasure). Wherever we were on our journey, the evening campfire was my favourite time of day. Normally we were on the move all day, either driving or exploring. So by the evenings we were ready to relax. It became a real ritual – stock up on logs from the park shop, gather some kindling, take at least three attempts to get it lit, set the chairs up then immediately have to move them out of the smoke. Then once the fire was roaring we got the snacks and drinks out and settled down for the evening. Campers are a sociable lot so we’d say hello to anyone passing by and sometimes end up chatting. 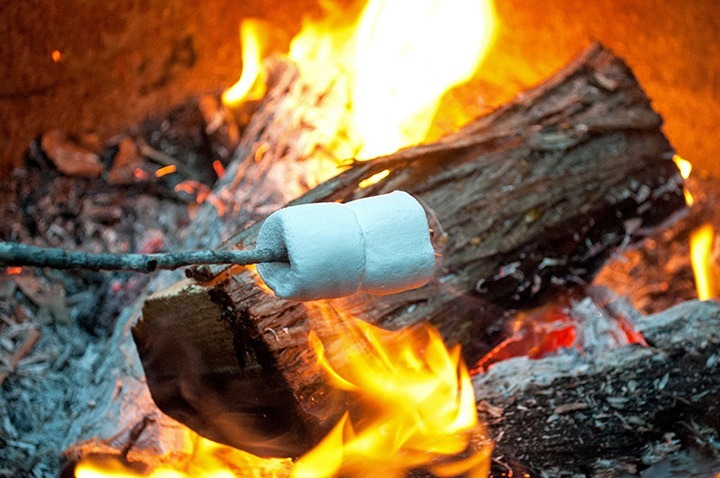 At some point the hunt for a perfect marshmallow stick would begin and we’d make ‘smores (melted marshmallows and chocolate in a cracker sandwich) or just toast them until gooey, staying out until both the sugar high and the light faded. 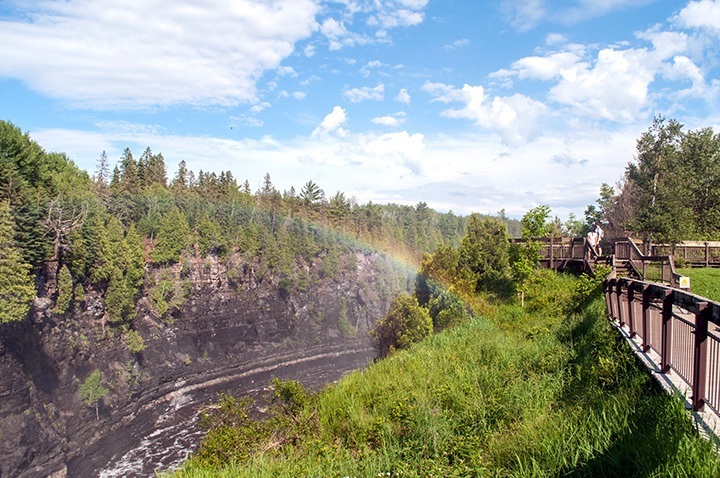 Everyone knows Niagara, but Ontario’s Kakabeka Falls is a bit less well-known, so I didn’t know what to expect from our stopover there. We arrived and set up our pitch before heading over to the waterfall just as the sun was starting to go down. At 40 metres high it’s an impressive sight, with water thundering down into the gorge. But it was the rainbows which made it extra beautiful. There were rainbows everywhere we looked – as we crossed the bridge one hovered just over the top of the falls, then as we walked through clouds of spray along the boardwalk they were all around us, always just out of reach. Lake Superior was my favourite campsite, stretching right along the shore of North America’s largest lake. Just a few metres from our pitch we had miles of beach stretching in each direction and and water as far as you could see. We headed straight down to the water’s edge and dipped our toes in the lake before retreating back up the beach. Someone had conveniently placed a bench with this inscription: “Have a seat, enjoy this bench. Love, peace and blessings to all who pass here”. You can’t argue with that, so we made a gin and tonic, took a seat and watched the colours of the sky change, reflected in the lake. Most of our road trip route kept us away from big towns and we spent almost every night in Provincial Parks. So dinner usually involved us cooking up something on the RV stove (followed by toasted marshmallows for dessert of course). I think we did a pretty good job, but when we arrived into Killarney and heard that the village was home to a fantastic fish and chip shop, we were happy to abandon the stove for the night. Herbert Fisheries sits right on the water in Killarney Harbour surrounded by boats. 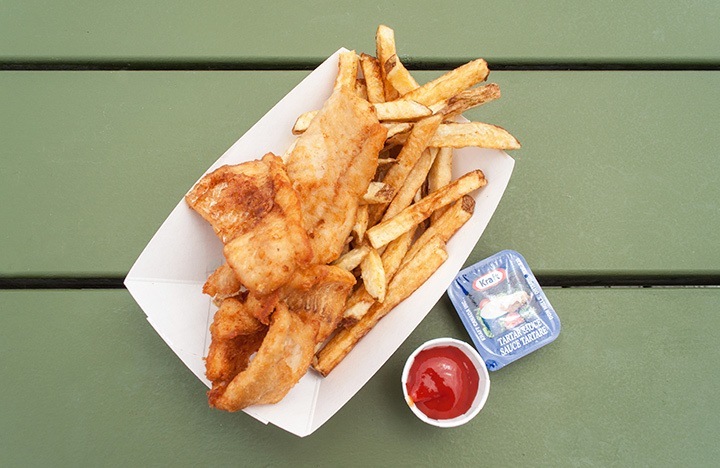 Every table was packed so we joined the queue and came away with a plate full of incredibly fresh fish and crispy chips cooked to perfection, doused in salt and vinegar. Sometimes the best meals are the simplest. There aren’t many times I’m ever really still, when I’m not trying to do at least two things at once. But being out on the water in Algonquin Provincial Park was the most peaceful I’ve felt in a long time. As we paddled out into Costello Creek all we could hear was the splash of our paddles through the water and the hum of dragonflies. We listened to our guide tell us about the park and kept one eye open for wildlife. But mostly we just paddled along, listened to the birds calling, soaked up the scenery and the sunshine. On my first trip to Canada I was lucky enough to see bears in the wild. 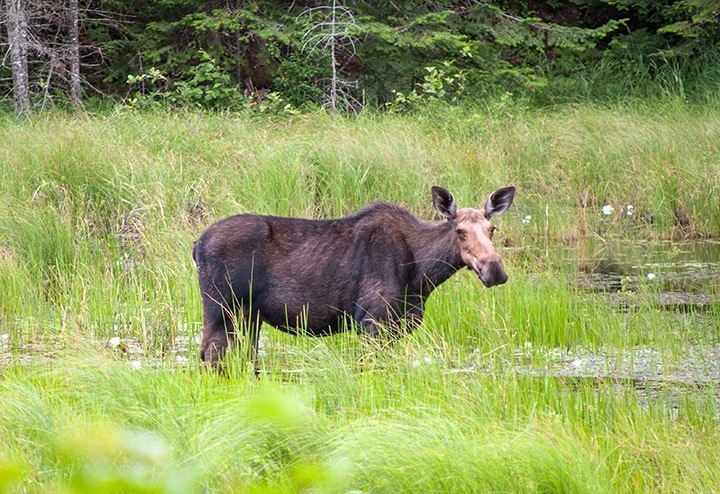 But one Canadian wildlife icon eluded us – the moose. So I was hoping to get lucky second time around. The moose hunt hadn’t been going well though, and we arrived at our final stop in Algonquin Provincial Park still not having spotted one. When we heard the park was home to 3000 moose we thought our luck was in. That was until we realised the park covered 2946 square miles – so that’s about a square mile per moose and a lot of places to hide. We’d canoed and hiked around the park and still nothing. But on our final drive back to our campsite something caught my eye out of the RV window and there she was. Munching away totally nonchalantly, she turned slowly to look right at us, before putting her head back down and tucking back in. After handing back our RV, we headed into Toronto for our final night at the Thompson Hotel. Our room wasn’t ready when we arrived, so the receptionist suggested we wait in the rooftop bar. So we emerged out onto the terrace to the most amazing view of Toronto – our first proper look at the city. In front of us was a forest of skyscrapers with the CN Tower rising up between them. Our mosquito-bitten, smoked-infused, slightly grubby, campsite look was a bit of a contrast to the rest of the glam rooftop crowd around the pool. But a few drinks and an amazing cheese plate later we were starting to feel right at home. When your driving days vary from four to eight hours long, you have to find ways to entertain yourself. But the random moments and in-jokes became as much a part of the fun as the places we visited. Along the way we discovered a love for Reese’s Pieces and Miss Vickie’s crisps. We stopped to pose for photos by the sign for every state or time zone line we crossed. I developed an obsession with town slogans – from the rather low-ambition ‘Redcliffe: Greenhouse Capital of the Prairies’ to the genius ‘Echo Bay: Worth repeating’. 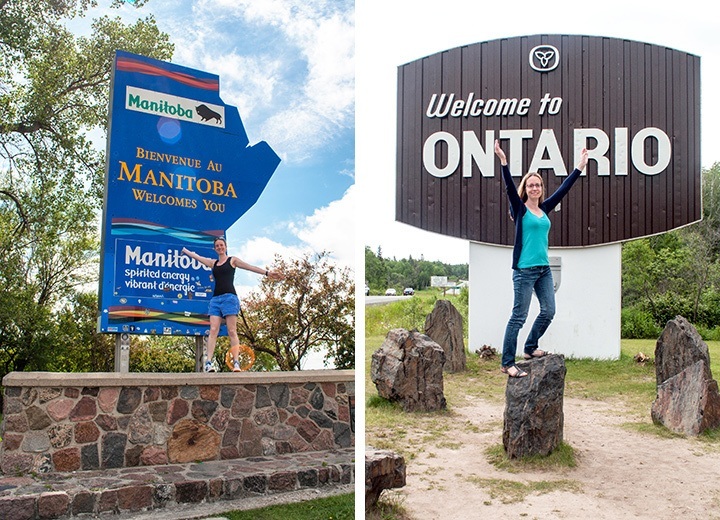 Each leg of the journey had a different soundtrack – we sang our way from Regina to Manitoba to Elton John, and saw how many 80s classics we could still remember the words to on the way through Ontario. But mostly we laughed, we chatted, we soaked up the views – and we fell in love with Canada. Never miss a photo opportunity! So would you like to take a road trip around Canada? Sounds like an amazing trip. Some amazing places on your journey! Certainly were, it was a fantastic experience! Now that’s one route I’d love to do next time! 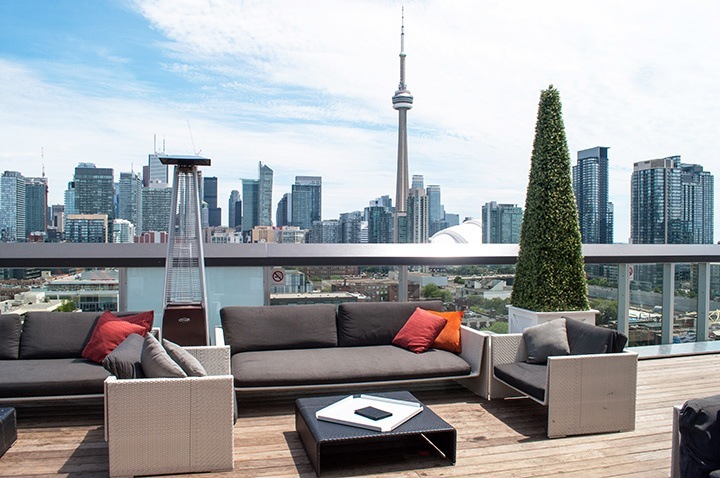 Poutine is amazing – and I love the view of Toronto from the rooftop bar of your hotel! Poutine is so good – totally unhealthy I’m sure but that’s what makes it so tasty! Such a wonderful mixture of things you packed into your two weeks on the road. canoeing through those lilies looks enchanting and I’d love to visit Toronoto one day. ‘Smores around the campfire, sunsets and rainbows – what more could you ask for? Exactly, it was so lovely to get back to nature – an unforgettable journey! 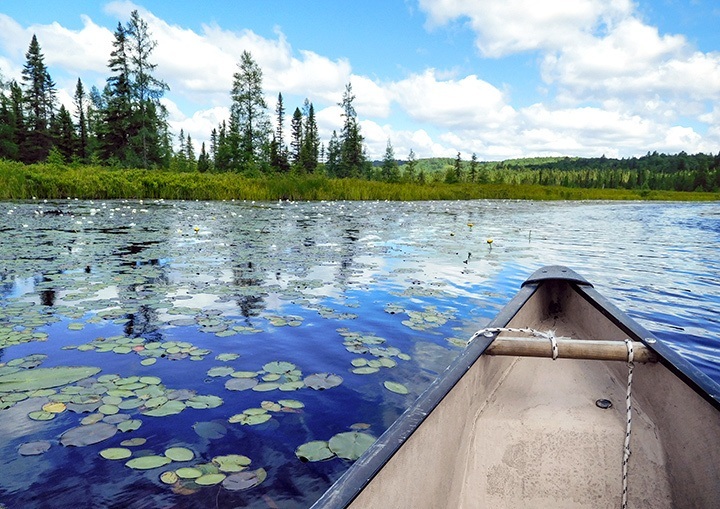 We also enjoyed the canoe trip in Algonquin but unfortunately we weren’t lucky enough to see a Moose – still we did see a beaver diving right in front of the canoe! We saw a lot of beaver lodges but never managed to spot a beaver – one for next time! Ohhh, this is just sublime, Lucy – what an eclectic mix of highlights. I just literally laughed out loud in the office at ‘Echo Bay: Worth Repeating’. No. 10 triggers some emotion and makes me want to return to Canada IMMEDIATELY! So made me want to go back while I was writing it too (not least to actually go and have a look around Echo Bay to see if they had a point or not!). We did the same thing this summer – what a great country and a great trip. One of our surprisingly favourite stops was in Winnipeg but of course nothing can compare to the mountains. Great blog! The scenery is just so beautiful, like nowhere else in the world! We didn’t get chance to have a proper look around Winnipeg but I’ve heard some good things about it – one for next time. Definitely agree it would be good to have a lot more time to explore if you have it – though we did manage to fit quite a lot into our two weeks! 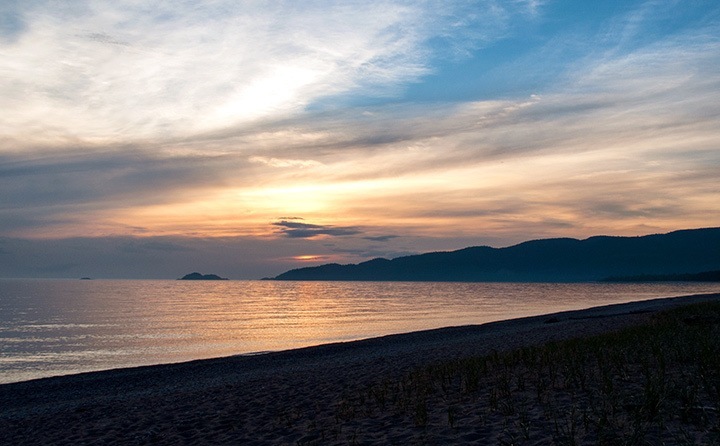 Such a good time to go, sounds like there are going to be lots of great events – and the free National Park entry is a bonus! 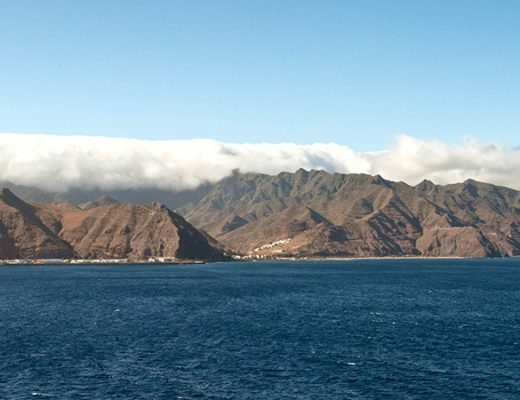 What a great selection of memories and experiences – you obviously had a very special trip. Yet more reasons to visit this amazing country. It really was an amazing experience, and I’d love to go back and see more! 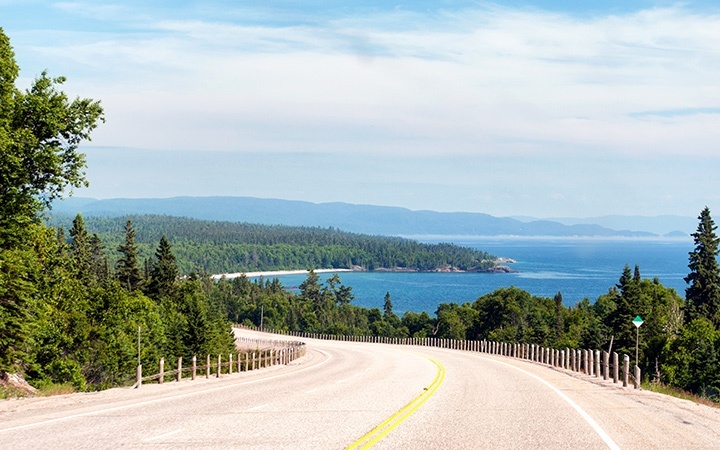 Thanks, there’s so much to see in Canada it’s perfect for a road trip. And I’d love to come and visit Sweden sometime, I’ve had plans to go for the last couple of years but it never quite worked out – here’s hoping 2017 will do a bit better! You are welcome! Feel free to contact me if you need info or support. Loved reading about your roadtrip. We did a 3 week RV trip around British Columbia and into the Rockies in 2010. 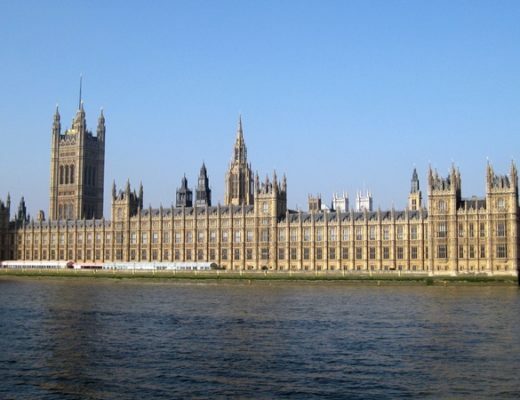 We will definitely be returning – maybe soon after reading this! We had such a great trip across the country, but I’d love to go and see the Rockies next – one of the other bloggers on our trip did that section and it looked amazing! The only problem with Canada is it’s so big and there’s so much to see that it’s hard to narrow it down! A beautiful journey. We recently did the trip from PEI to Tofino. 10,080km in all and enjoyed many of the same areas you stopped by. Glad to see you had a great trip. Thanks – it was an incredible experience! Your trip sounds amazing too, PEI is on my to-visit list for next time for sure. Thanks, it was a fantastic trip! You certainly had lots of fun, and I did my Toronto and Banff National Park trip last summer in August. I flew from Toronto with family after staying eight days to Calgary, then hired a car for four days and stayed in Banff. Lake Moraine is one of the most surreal lakes I have ever seen, Lake Louise and Bow lake are also stunning. Driving from Baff National Park and Jasper Park is one of the most scenic drives in the world. Did you not do Banff National park? We as a family travelled around 40 countries in different continent extensively. I love your blogs and had so much information from your Jordan trips & Petra. Thanks so much! This trip was focused on the prairies and Ontario so we only headed east from Calgary, but I would love to see Banff next time. Well I would say come back to Moose Jaw soon – but you more than likely saw it all in one afternoon. HEHEHE. Seriously I love living here. Looks like a great trip you guys took. There is of course a LOT of history they don’t tell you – but that is all morbid stuff. Come to think of it it might make an interesting tour.